Birch water (es Baerkewasser; die Baerkesaft) is now an industry for some Eastern and Northern European countries (I found some from Ukraine yesterday), but it is also something that has been drawn here in the Deitscherei since arrival. Sweet Birch (Betula lenta) is usually tapped for birch water in late February or early March, and the birch water is collected via a tube into a bucket, pretty much like maple sap. Unlike maple sap, though, birch comes out like water and may be consumed directly as is. 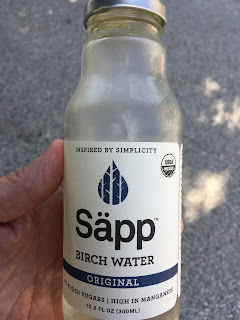 Most of the birch water collected is directed toward the production of birch beer, which is in itself a Deitsch beverage, but birch water is still consumed and turns up at some farmers markets. It can easily fulfill your daily intake needs of Manganese. Tapping birch and extracting birch water for direct consumption or for processing as birch beer or birch syrup is not particularly difficult. I suggest that reader check out the article from Joybillee Farm on how to extract and to process birch sap. Birch water, birch beer, and birch syrup are Deitsch traditions, and we in the current generation can invigorate them by learning how they are done and by making our local products more readily available.